This morning I notice that ‘The Book Bench’ in the The New Yorker magazine have covered WORKERS 工人. See the brief article titled WORK UNIT here or read below. Under Loose leafs from the New Yorker Books Department this article was published on the 19th June. Last December, the photographer Helen Couchman shot portraits of a hundred and forty-three Chinese laborers at the construction sites of the two most iconic buildings of the Beijing Olympics, the National Stadium (a.k.a. the Bird’s Nest) and the National Aquatics Center (a.k.a. the Water Cube). 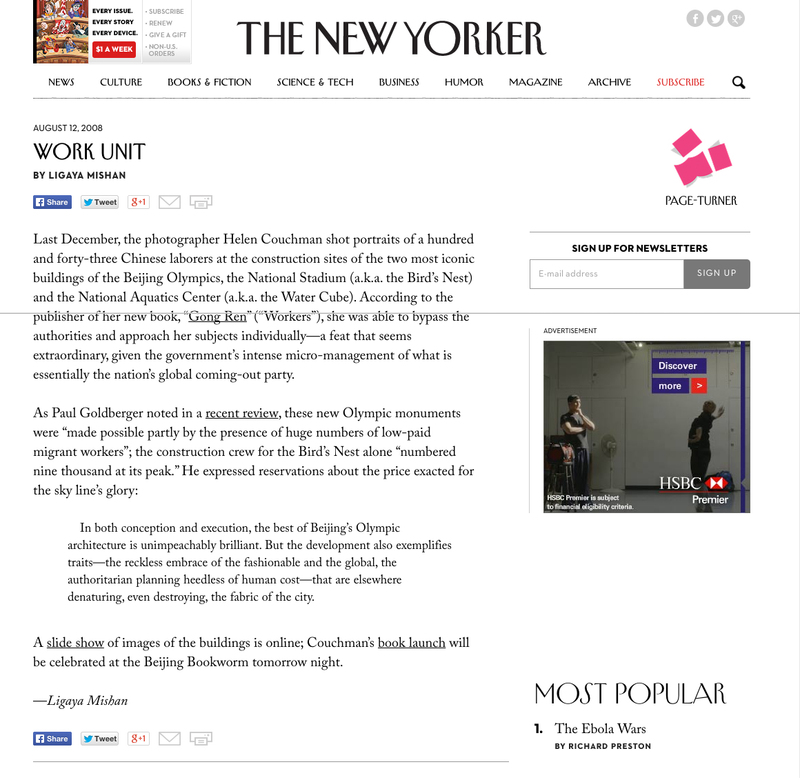 According to the publisher of her new book, “Gong Ren” (“Workers”), she was able to bypass the authorities and approach her subjects individually—a feat that seems extraordinary, given the government’s intense micro-management of what is essentially the nation’s global coming-out party. In both conception and execution, the best of Beijing’s Olympic architecture is unimpeachably brilliant. But the development also exemplifies traits—the reckless embrace of the fashionable and the global, the authoritarian planning heedless of human cost—that are elsewhere denaturing, even destroying, the fabric of the city. A slide show of images of the buildings is online; Couchman’s book launch will be celebrated at the Beijing Bookworm tomorrow night.